In this post, we have covered key hospitality interview questions. We have also provided guidelines to answer these effectively. Hospitality industry job seekers out there, please stick with us and read on. There is a lot of information on offer. Hospitality industry touches lives of almost everyone around the globe. Our experience is enhanced by quality service. All hospitality organisations strive for that extra happiness or the delight that they can provide to all the customers. Hence, the hospitality organisations require best people around to make this happen for them and get them ahead in the competition. One of our posts list the Best Hospitality Job Portals around the world. Do give it a look once you are through this post. The opportunities are plenty but then there is a fair bit of competition as well. Thus, hospitality professionals need to go through a rigorous interview process to qualify for a job especially if it is a senior management job. 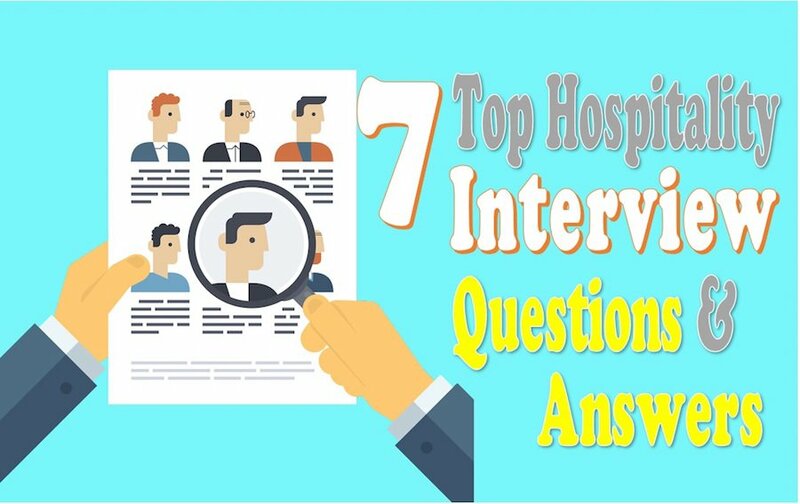 In this post we will discuss 7 hospitality interview questions, the answers to which will serve as building blocks towards selection. Hospitality industry professionals at time fail to prepare well for their interview due to the hectic schedule. But, this is the first mistake to make. It is important to remember that ‘Failing to prepare is preparing to fail’. We have found out that the below hospitality interview questions have been asked the maximum times by the interviewers through our data collection involving the first-hand experience. These are the most frequently asked hospitality interview questions. We have been involved in interviews of thousands of hospitality professionals over the past 8 years and found various versions of these questions doing rounds in almost all interviews. Hotel industry professionals can find more relevance to these questions as most of the samples evaluated were of hoteliers. However, these might be equally relevant for any other hospitality industry professional from the non-hotel background. Passing a job interview, for a hospitality-driven firm or business might be quite difficult because of generic entry criteria and stiff competition. Another reason for this is that most candidates are not prepared enough to answer the questions comprehensively. This is the key reason for hotel industry professional not getting through their interviews. So, preparing yourself for the hospitality interview questions will help those nerves to settle. Moving on to the questions. The questions are listed below and then explained in greater detail with answer guidelines. What is your prior experience in the hospitality industry? What challenges do you expect to face in the hospitality industry? What are your career goals in the hospitality industry? Tell me about a situation when you delighted a customer through your services and professionalism. If you get the job, how do you see yourself growing in this company? You have approximately 2-3 minutes to answer this. This is where your research and passion for hospitality comes into play. The hospitality industry is a busy one, and companies love what they do. Similarly, they are finding someone who knows how the company works and the services they provide. Hence, make sure to gain prior knowledge about the company, for example, the set of services or the senior staff. It is equally important to reflect on the culture of the company as an understanding of culture will give you a clear edge ahead of competitors. Make sure you clearly go through the website of the company, the social networking profiles and some recent NEWS or buzz about the hotel. Below is a generic example. Please make sure, you customise it around your targeted company. “Thanks for the question. It is the interest in this company that pushed me towards applying for the position. What fascinates me most about this ‘hospitality firm’ is its mission towards being the best in the ‘luxury hospitality segment’ and with a history of 40 years in the luxury segment, it is well on course to achieve that. With a presence in ‘90’ countries through its ‘4300’ establishments, this organization outshines all its competitors. I have been following this company on ‘LinkedIn’ and ‘Facebook’ for the past few months and have been amazed to see the growth rate and excellent customer reviews. The above example is just a basic one to give a guideline. Let your answers flow from within so that the interviewer is aware of your intent and preparation. Build your own answer around this guideline keeping the below key points in mind while answering the question on what do you know about the company you are applying to. Do throw in the numbers as that speaks of your research on the firm. Be succinct and do not take more than 2-3 minutes. If the interviewer wants to know more he/she will ask to elaborate. This is a question similar to the previous one but the employer would like to hear a different story. You can also include a couple of things that you missed to include in the answer to question 1. To answer this question, you need to make sure that you know a few things about the company, for example, its culture or clientele. If you are a hotel industry professional then our Great Hotelier guide will help in answering this question. Use the tips in the post to frame your answers. Show your interest, your passion and why do you think the firm can shoulder that passion to greater heights. This question gives you an opportunity to mention your key strength and knowledge about the company that is only available to those who have a deep understanding of the hospitality industry and of that particular company. It is one of the most important questions and the employer would want you to speak for about 3-4 minutes. It is this question that sets the course for the rest of the interview. Make sure you set the tone right by answering this question clearly and concisely and the rest of the interview will go smoothly. Tell me about your experience in this industry. If you are applying for a position in the hospitality industry, chances are that you have loads of experience, which you should mention from start to end. However, if you are switching careers, make sure to be creatively honest about it. This question gives you an opportunity to answer all the questions of the interview at one go. Express your personality through this answer. Make sure to consider the below to frame an ideal answer. Never bluff with the employers. They can read your face. Try to be as creative as possible and if you see your interviewer getting disinterested, move to the next experience and spend more time on the experience that you feel gets the bell ringing for the interviewer and that connects well with the job profile you are applying for. What do you know about the hospitality industry in general? This is an opportunity for you to show your knowledge of the hospitality industry. The question can be re-framed in different words but the aim of the interviewer is to check if you are well aware of the what, where and how of the hospitality industry. You need to make sure that they know you are up for any challenge the company throws at you. The main reason for asking this question is to measure your passion, which can only be answered by telling how you can optimise your skills. This is a double-faced question and you need to cover both the facets of the coin. Consider the points below. What do you know about the trends of hospitality industry? What are your weak points that you want to work upon? What are the areas you can improve in and how do you intend to do that? How to keep yourself motivated in the hospitality industry and what drives your passion? Answer these questions and your question will be addressed automatically. This is an open-ended question and the interviewer doesn’t expect to have a definite bullet point as the answer. Even doing a SWOT analysis of Hotel industry in your specific area helps. It makes you look strategy oriented with attention to details. Use your analytical skills to your advantage by presenting your strategic side to the interviewer. The interviewer would like to judge your passion for working in the hospitality industry. This is a very popular interview question in the hotel industry. Hoteliers must have knowledge about top hotel chains of the world and of the overall industry to be able to tackle this question. This is one of the hospitality interview questions asked to check your ambition. Make sure that you are portrayed as an ambitious person as it will also suggest that you are hard-working. Career Management skills are key here. It starts with identifying your objectives and creating an action plan around that goal. Assure them that you have your goals mapped out and you are working to fulfil them. Please follow the points below. This question checks your energy. This is the question where you need to show your zeal of true hospitality professional. Whether you are a hotelier, a travel and tourism professional, an event coordinator, aviation professional, cruise team member, food service professional, Chef or facility service professional; you need to prove you are made for this industry. You need to show your interviewer that you are a strategic person who is goal oriented and who works hard to achieve those goals. If you are a fresher and looking for your first job or changing your field, the below video might be of good help which highlights the most fundamental question asked by hotel management recruiters. Speak about a situation when you managed a difficult situation in previous hospitality firm. Tell me about a situation when you delighted a customer through your service and professionalism. These questions give you an opportunity to speak about your qualities as a hospitality professional and as a person. These qualities may include your experience, your capability to work under pressure, your educational background, your customer service skills or your management attributes. Do consider the points below to draft an answer to the above questions? Don’t just make up the situations. The interviewer may ask details about the situation. Story should be short and the process of handling and managing should be detailed. Build a storyline to keep the interviewer engaged. Speak about your strengths while answering these. What do you bring to the firm if we hire you? The close-knit nature of the hospitality business urges your employers to ask you this question. They need to see if the person they are hiring is loyal and reliable or not. Make sure that they know how you plan to work and develop and how you can be an asset for the company. The hospitality industry has one of the maximum staff turnover ratios and thus all employers want to hire only those who would be stable. So, this is your opportunity to assure the interviewer that you are here to stay and have a goal attached to the hospitality company you are being interviewed for. If you have been a job hopper in the past, it gets all the more important to give a detailed answer to this question. Make sure you explain why history will not be repeated this time. Again, you can do so by attaching the culture of the company to your personality and tagging your goals with the goals of the hospitality company you have applied to. The above-mentioned list of hospitality interview questions includes some of the most common interview questions your prospective employers might ask in a hospitality interview. Hence, make sure you are well prepared to answer these. As a hospitality industry professional you already have your basics right. Be energetic. You already know the importance of Service in the Hospitality industry. So, be ready to share your experiences in terms of how you excel in providing quality service in whatever you do. However, please ensure you don’t answer these question mechanically. Let your personality be reflected in the answers you frame. There would be other technical questions around these general question and thus answering these well will help set a positive tone for the more intense and somewhat unexpected technical round. All the very best for your next Hospitality Interview!